Well, they definitely got the title right. 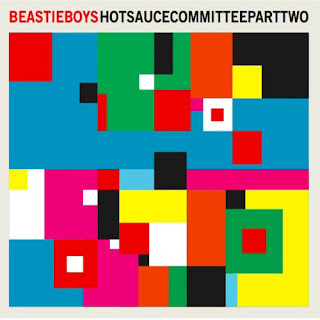 The beats on The Beastie Boys's latest release, the partyriffic Hot Sauce Committee Part Two, are dynamite...bubbling lava...boiling marinara...a "meat"-ballsy, red hot sauce of screeching synths, over-processed samples, and who knows what else they decided to throw into the mix. If the Flaming Lips had decided to convert their 2009 skronk fest Embryonic into a party rap album, Hot Sauce Committee Part Two would have been the result. And like Embryonic, at least on a micro level, Hot Sauce borders on near masterpiece territory. Studio wonks are going to get off on this album for years, so impressive is the production, so clever the dial tweaking. This is an album where no recorded element has been allowed to exist in a natural state: everything...voices, instruments, samples...is subjected to multiple layers of studio manipulation, making for an incredibly dense, lively bed of detail that continues to cough up revelations even after dozens of listens. Unfortunately, this massive attention to nuance does come at a cost. For all its micro-layer dynamism, on a macro level, Hot Sauce Committee Part Two can be frustratingly static. Like that sauce boiling in a pot, there's a ton of vertical bubbling and popping in the beats, but little to no horizontal movement, no sense of musical progression. The Beastie's vocals, overflowing with energy and attitude, but near incapable of carrying melody, only reinforce this limitation. What one's left with, then, is a collection of fun, vibrant, similar sounding tracks that are hard not to like, but even harder to love. The two divisive exceptions to this pattern are the reggae-tinged, Santigold collaboration Don't Play No Game That I Can't Win and the driving, punkish Lee Majors Come Again. Dismissed by some critics for being out of step with the rest of the album, I think they rank among the album's most important tracks for the exact same reason...they're the only tracks that deliver what the album most sorely needs...melody and forward momentum. Lee Majors Comes Again, in particular, hits with a rejuvinating forcefulness that seems to adrenalize the album's entire back third. Of the more straight forward rap numbers, I like lead single Make Some Noise, Here's A Little Something For Ya, and the slow, low chugging Nonstop Disco Powerpack the best. I'm also a big fan of the instrumental Multilateral Nuclear Disarmament, which highlights the band's unique sense of groove. But in many ways, the album's finest moment is also its simplest, the all too brief interstial The Larry Routine, one of the goofiest...and funniest...rap skits I've heard in quite some time. So in the end, a split vote. Thumbs up for the album overall, thumbs way, way up for the production. It's one of 2011's best party albums, but is just a little too infatuated with texture at the expense of movement to warrant a strong recommend. Cherry Picker's Best Bets: Make Some Noise, The Larry Routine, Lee Majors Come Again, Multilateral Nuclear Disarmament, Here's A Little Something For Ya. Here's the celebrity-stuffed video for Make Some Noise. What are your thoughts on The Beastie Boys Hot Sauce Committee Part Two? Let readers know.